Compared to moms, dads are notoriously difficult to shop for. One thing’s for sure: a bouquet of flowers won’t cut it. But if your father enjoys grilling or barbecuing (and few dads don’t), you don’t need to stress out. Which brings us to one of our most popular blogs of the year: our annual Father’s Day Gift Guide. We’re publishing it well in advance of June 18th this year, to give you a full month to shop for a gift for that most important man in your life. And if you’re a father yourself and see anything here you’d like . . . well, no one would blame you for printing out this list and leaving it in a conspicuous place. To all those dads out there, happy Father’s Day. This day is yours and we hope it’s a happy one. This company’s mission statement sets just the right tone for Father’s Day: “We will foster the link between sustainable land use, small-scale food production and preservation of the foods of past generations for future generations.” Treat Dad to some of the most carefully curated—not to mention cured—bacon on Planet Barbecue. Three-month to 12-month subscriptions start at $60. Bacon samplers featuring heritage breeds like Red Wattle and Old Spot are also available. Buy Dad a six-pack for Father’s Day! No, not that kind of six-pack, but a collection of six unique spice rubs Steven developed to bring new and exciting flavors to the table. 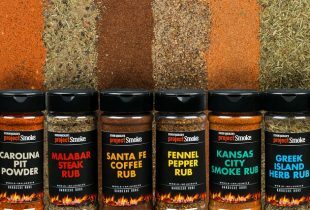 They include Malabar Steak Rub, Carolina Pit Powder, Kansas City Smoke Rub, Santa Fe Coffee Rub, Fennel Pepper Rub, and Greek Island Herb Rub. Family dinners just got a lot more global, and interesting. We will soon post several recipes for all on our website. This elegant, superbly crafted knife glides through large hunks of protein (brisket, turkey, and ham) like butter without tearing the meat or fatiguing the designated meat carver—usually Dad himself! Perhaps you’ve seen it on the set of Project Smoke. It’s one of Steven’s favorite blades. Made in Japan of high-carbon vanadium stainless steel (the durable handle is polished pakkawood), this knife is destined to become a family heirloom. It comes in a very cool wooden sheath called a saya. Steven’s latest book, an ambitious revision of the popular title he first published in 2000, was released just in time for Father’s Day. With color photos and over 200 recipes—50 of them new—Steven proves there are opportunities to add explosive flavors to foods before, during, and after their assignation with smoke and fire. Brines, rubs (both wet and dry), slather pastes, marinades, mops, sauces, cures, and condiments from the world’s grilling cultures make this book a “must have” in any serious griller’s library. Bundle it with Project Smoke for a gift Dad will use and appreciate for years. Maple syrup has a surprising affinity for barbecue. (Check out our recipes for Maple-Sriracha Glazed Chicken Drumsticks or Planked Salmon with Maple-Mustard Glaze.) 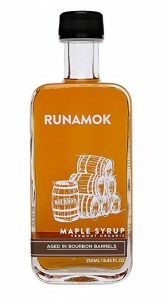 Runamok, an out-of-the-box artisanal producer in northern Vermont, has created an intriguing line of smoked, infused, and barrel-aged syrups—ten varieties in all. You can buy individual bottles (we loved their pecan-smoked maple syrup) or create custom gift packages. Great for glazes, brines, barbecue sauces, griddled pancakes or French toast, even cocktails. Enroll your father in BBQU, and he’ll not only have a year to anticipate the experience, but have bragging rights for a lifetime after attending what’s been called “one of the best food lover’s events in the nation.” It’s an action-packed whirlwind of food and fire (not to mention golf, fly-fishing, zip-lining, and other fun pursuits) at one of the most luxurious resorts in the country. This exclusive class, taught personally by Steven, is very hands-on and covers all the methods of live-fire cooking. Dad (and you, if you join him) will come home with mad skills. Dates for the 2018 program will be announced on this page in June. If your family loves ribs, this is the perfect gift. 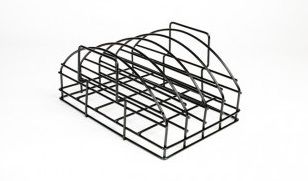 Dad likely needs a rib rack, one of the best sellers in Steven’s line of barbecue products. It quadruples the number of racks of ribs the patriarch can cook at one time using limited grill grate real estate. Ribs cooked upright literally baste themselves, making them more tender and flavorful. We can’t imagine life—or the Fourth of July—without one. For an even more amazing gift, couple the rib rack with a family pack of pork ribs or Best of Barbecue Suede Grill Gloves. Self-serving? You bet. 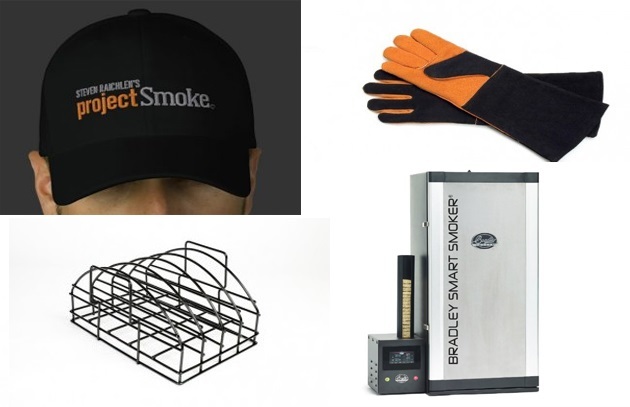 Since Season 1, Bradley digital smokers have been workhorses on the set of Project Smoke. We’ve smoked just about everything in our Bradleys—ribs, seafood, deviled eggs, jerky, and more. And they couldn’t be easier to use. You simply load the feeder tube with Bradley “bisquettes” (flavored sawdust disks), which travel through the smoke generator on the side of the unit. The temperature (there are two separate probes) and the amount of smoke can be digitally controlled from the unit itself or through any Bluetooth-compatible device. 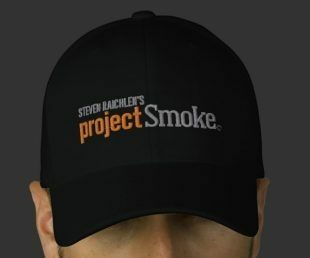 If you or Dad enjoy the “outtakes” that trail each episode of Project Smoke, you’ve likely noticed the black T-shirts and baseball caps with orange logos the crew wears on the set. We received so many inquiries that we decided to screen-print a limited number to sell through our website. The short-sleeved T-shirt is made of heavyweight cotton with double-stitched hems and comes in adult sizes up to 6X. The hat is available in three styles: a Flexfit wool fitted cap; chino twill adjustable cap; and distressed chino twill adjustable cap. One of our go-to grills is the iconic 22.5-inch Weber kettle grill. But an improvement we heartily endorse is a rotisserie kit. It comes with a sturdy electric motor, a heavy-duty spit, and rotisserie forks as well as a 6-inch metal collar that creates clearance for spit-roasting and raises the grill lid. So not only does it allow you to spin poultry, roasts, and even whole pineapples, but you now have the necessary head room for whole turkeys and beer can chickens. This versatile and ingenious device, made of sturdy pre-seasoned cast iron, beats the heck out of socks and/or ties or anything that’s normally stored in a dresser drawer. 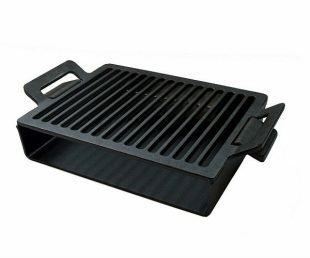 The solid cast iron base can be used alone as a plancha to sear meats, or as one part of a grilling and smoking platform. To use as a smoker, add wood chips to the base and place the grate on top so that your food cooks directly over the chips, taking on a smoky flavor. This set also includes a stainless steel humidifier, so Dad can keep meats moist with steam using his choice of water, marinade, beer, or wine.